The indicators selected to measure whether we are a community that is safe, just and engaged are the overall crime rate, whether people of different races are disproportionately booked into jail, and voting. There is good news for the crime indicator. Over the five years from 2011 through 2015, the crime rate in Travis County decreased by 25%. Both violent crime and property crimes declined. Arrest disproportionality has been stubbornly persistent for Black residents of Travis County. While Black residents account for 8% of the total adult population in Travis County, 21% of all people booked into the Travis County jail are Black. A recent report by the Urban Institute and the Center for Policing Equity finds that Black motorists are four-times more likely to be arrested after being stopped by the Austin Police Department as White motorists. This problem is not unique to our community, and solving it will require collaborative action. An analysis of voting data from the last Presidential election shows that young people and people of color are least likely to vote. People who are White and older are most likely to vote. There is some good news with voting—more people voted in the 2016 presidential election than in the previous presidential election. Also, there was a 67% increase in the number of Hispanic voters in Travis County who participated in the election. The poverty rate for all races and ethnicities has declined since the end of the Great Recession, however, disparities remain. About one-fourth of all Hispanic and Black residents of Travis County live below the federal poverty threshold, which is about $24,000 for a family with two adults and two children and $19,000 for a family with one adult and two children. Less than one-tenth of White residents live below the poverty level. As the graph at right shows, the disparity for children is even greater. 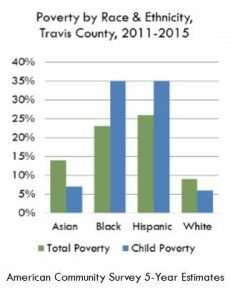 More than one-third of all Travis County children who are Hispanic or Black live in poverty. High rates of child poverty indicate this is an issue that requires greater support for families. Finding an affordable place to live is a challenge for many people. Thirty-six percent of households in Travis County are housing cost-burdened, and many have moved further away from Austin to find housing they can afford. When families live far from where they work, they face longer commute times, higher transportation costs, find it more difficult to be involved with their children’s school or other community activities, and may not have ready access to healthy food, healthcare and other important services. Black residents are over-represented among those who smoke, those who are obese, and those reporting poor mental health. There are life and death consequence to these health disparities. 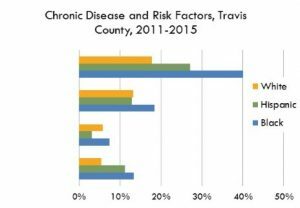 According to Austin Public Health, Black residents also have the highest rates of cardiovascular disease and diabetes—diseases more prevalent among those who are overweight or obese. Health disparities by income are even greater than disparities by race or ethnicity for mental health, smoking, and those with no health insurance. In Travis County, 31% of all people under the age of 65 who are low-income have no health insurance. This is almost twice the rate overall. Hispanics are more likely to be uninsured than people of other races and ethnicities. According to the Texas Behavioral Risk Factor Surveillance System, 28% of Hispanics under the age of 65 are uninsured. Much of the overall increase in the number of people who have health insurance is due to implementation of the Affordable Care Act, which is not available to people who are undocumented. Educational disparities exist from kindergarten through college in Central Texas. Many children enter kindergarten already behind their peers. Only 28% of low-income kindergarteners were school ready, compared to 61% of children from moderate to high income households. As the graph at right shows, the disparities in high school graduation rates are smaller than the disparities in college success. For the high school graduating Class of 2009, about 30% of Black students and 44% of Hispanic students who enrolled in a Texas college completed a post-secondary credential by 2015. The college success rates for Whites (56%) and Asians (69%) were much higher. Even though college success rates for Hispanic students are low, they have improved from 35% to 44% over the past five years. Since the end of the Great Recession, unemployment rates have fallen for all races and ethnicities, however, disparities remain. 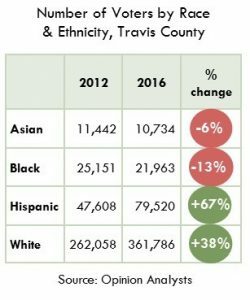 The unemployment rate for Black residents of Travis County is about 10%, which is two-times the 5% unemployment rate for White residents. The Hispanic unemployment rate is 7%. © Copyright 2019. CAN, Community Advancement Network. All rights reserved.